Having set up initially as a ‘cupcake’ only business back in 2013 I began to take the business in a different direction as I expanded my portfolio. I now offer wedding cakes, tiered birthday cakes, cookies and cake pops! This is a far cry from the days when I only offered cupcakes and giant cupcakes. I love the variety of the work I do but I must admit I began to miss the cute little bite sized dessert AKA the cupcake. Thankfully, I’ve noticed an increase in demand for branded cupcakes for corporate events. Like most businesses everyone wants to stand out from the crowd, be successful and have customers recommend their services and spread the word about their business. With business comes marketing, training and events and I think that corporate cupcakes are a great idea. I mean, let’s face it, as a business you’re onto a winner, giving out free cupcakes decorated with your logo, slogan or image of your choice. Potential customers are certainly going to converse for a bit of the sweet stuff. Who doesn’t like cake? Cupcakes are the perfect offering for any business to give their customers, staff or business partners. Not only do they look and taste delicious (and are might I add), they are also the perfect social media marketing tool. No doubt pictures will be taken and shared on social media channels each one bearing the business logo/slogan or image. 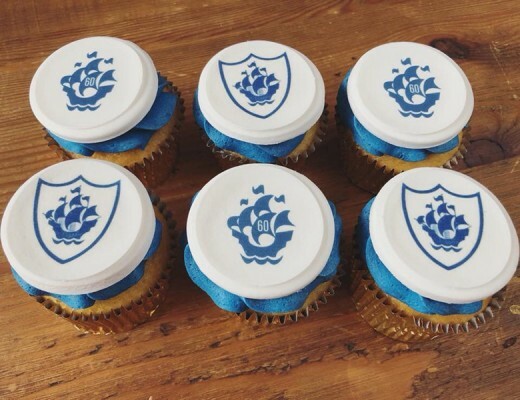 Blue Peter celebrated their anniversary with some of my cupcakes which were aired on TV! Whatever the reason, branded cupcakes are a tempting treat for most people. We print using a quality edible printer onto pre-cut fondant discs. Each one is mounted onto a thicker fondant disc and then carefully placed onto the cupcakes. We ensure that presentation is spot on. The cupcakes are presented in sturdy cardboard boxes with cardboard inserts, cupcakes are in foil paper cases to ensure the cupcakes stay fresh for up to a week. And for bonus eco points, all my packaging is 100% eco-friendly, no plastic in sight! If you’re a cupcake business, why not approach local marketing, PR, web agencies to see if they would benefit? I would also recommend purchasing a good edible printer or finding a good cupcake topper supplier. I use Edible Printing Supplies for my toppers and have a Canon edible printer and Photoshop to create bespoke toppers. If you are a business wanting to wow potential customers and engage on another level branded cupcakes are a great tasty treat. 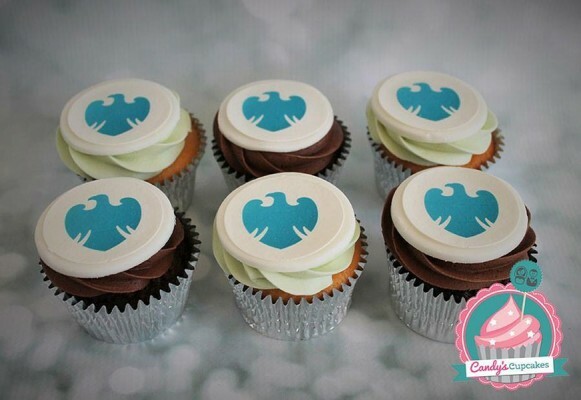 You can buy branded cupcakes online with next day delivery or if you require more than 50 cupcakes take a look at my corporate cupcake price breaks.